Instructions: Card base is 7.75 x 6". Cut a 7.75 x 12" cardstock in white, score at 6" and fold to create card base. And a pattern paper from the Butterfly Dreams collection. Adhere these two together. Die cut out the Eyelet frame die on white card and place this in the center of your card and decide where your sentiment from the Today's Quotes will go and stamp the sentiment with coffee archival Ink. Die cut another Eyelet Lace Frame from the same pattern you used for the background. 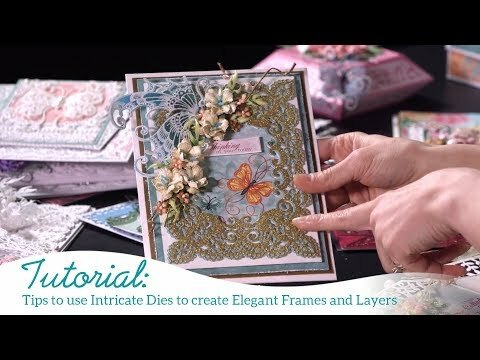 Layer these on the card base by offsetting them centering the sentiment in center of the two frames. Stamp on foam paper using Magenta Hue Archival ink two sets of large peony and four sets of the largest of the small peony. Die cut out. Color front and back with pink peony archival ink. Pierce center with paper piercer in kit and make a hole to make room for stamen. Stamp on foam paper with fern green ink the medium peony leaf three times, color using Leaf green ink. Lightly heat these and add some crystal clear. Cut out a set of the smallest peony on white card and we will use these as fillers making sure to insert a stamen into each of these. I used four and colored them with the Buttercup ink. Stamp and cut one classic rose vine on white card using coffee archival ink and color with leaf green and fern green cut into three pieces as we are using only one piece. Heat the foam paper from the front, not from the back and be careful to not over heat, the petals will curl inwards which is what we want it to do. Lightly shape these with the molding mat and stylus while it is still warm, careful to not press to hard on the foam paper or you will have an impression from the molding tool and we don't want that either. Make two large peonies, using one large and one medium peony and create four small peonies using the small set. Use three - four stamens on the large set and two in each of the small flowers. I did use my glue gun to set these and adhere to the card base. Tuck in the peony leaf. Detail with crystal clear and complete assembly as shown in my sample.